We were recently encumbered with a large hurricane that came up the coast. The storm was preceded by about a week of steady heavy rains and horrible humidity, but at least the winds were bad. Ooh, what a lovely tea party... Anyway, the perfect combination of terrible weather phenomenon quickly provided a large selection of lumber as trees started falling everywhere. I must mention that I am very lucky in that I have some really great (read: tolerant) friends. Fortunately for me, they are also all enablers supportive! I was at a dinner party at a friends house when he mentioned that his parents, who own a beautiful farm near Pennsylvania, were cutting up some trees on their property that had fallen in the storm. 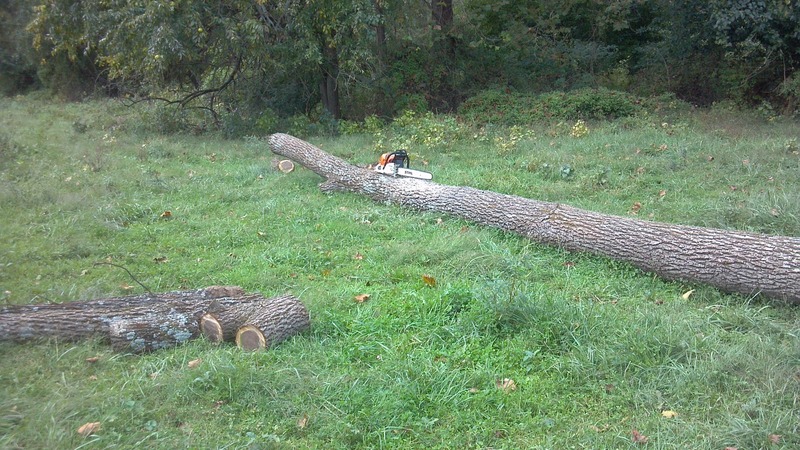 One of them was a rather large Black Walnut tree. I must have suddenly turned into a screaming pre-teen girl at a Justin Bieber concert because everyone just started laughing when I stopped mid sentence to squeal and ask for my friends mothers phone number (which also came out weird). His parents, whom I have known for a long time as well, were more than accommodating about inviting me up to look at the tree and were very good about not laughing out loud when I told them I wanted to mill the tree myself. So, I made plans to come back when my mill showed up in the mail. 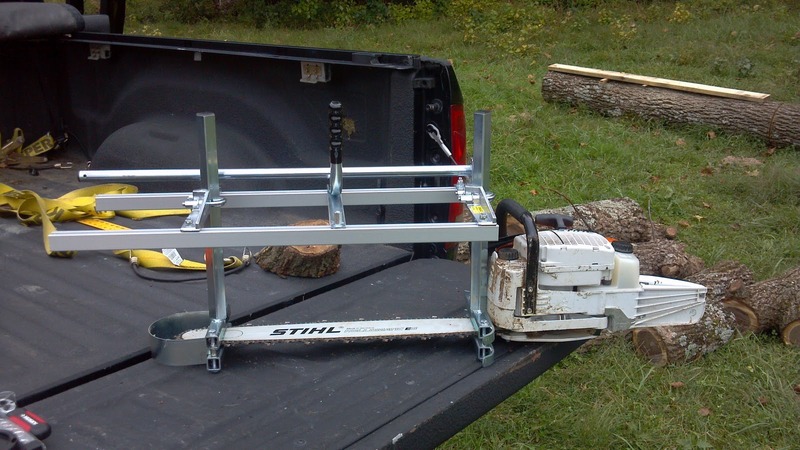 I have a Stihl MS660, which is a 91cc chain saw. 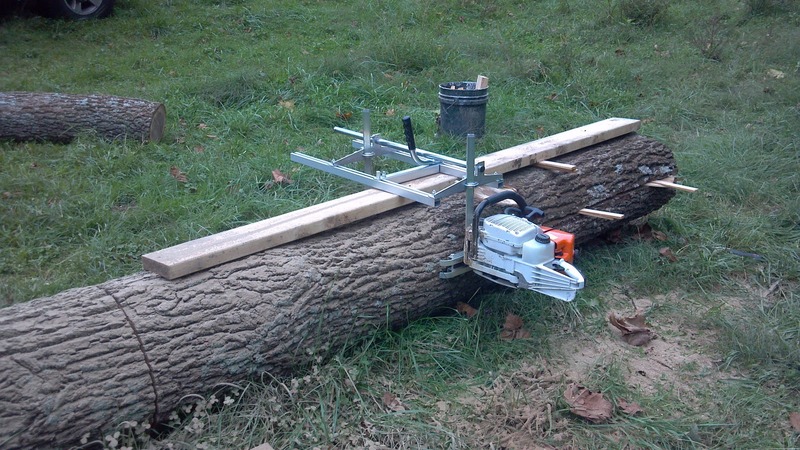 I have a 25 inch bar on it but it is powerful enough to accommodate a much larger bar, so it is a sizable saw on it's own for a handy homeowner. I hadn't planned on milling trees with it when I got it but I was excited to see this product from Granberg, it is an Alaskan MK-III Small Chainsaw Mill (link embedded). I went with the less expensive one as I wasn't sure how much I'd actually enjoy or use this, however, after my first rodeo with this I'd love to own the larger one, the C-2 (hell, if I'm bothering to dream I'd love to own a $10,000 woodmizer)! A bandsaw style system would eat up less wood in the saw kerf because the blade is so narrow, but without spending thousands of dollars on a mill I'm happy to sacrifice a little wood for the convenience of being able to mill almost anywhere! The kerf on this setup ended up being a little over a half of an inch by the time I was finished so over an entire tree there is quite a bit that ends up being sawdust. Note** I did have to remove the dogs from the chainsaw to properly install the rig. I would definitely recommend ordering the rip chain and the bolt on oiler with the product, I have been waiting for my rip chain from Stihl for three weeks... The rip chain would have definitely made this project run much smoother, but I knew that from the beginning. I was just impatient and wanted to get things rolling. I had a new crosscut chain which actually did well for the first half of the day, but dulled quickly and didn't clear enough material fast enough for a real long rip cut. On another note, the build of this product is excellent for it's cost. It is sturdy, well machined, and easy to use. It took me about forty minutes to put it together out of the box (it comes in a million pieces) but wasn't complicated at all. 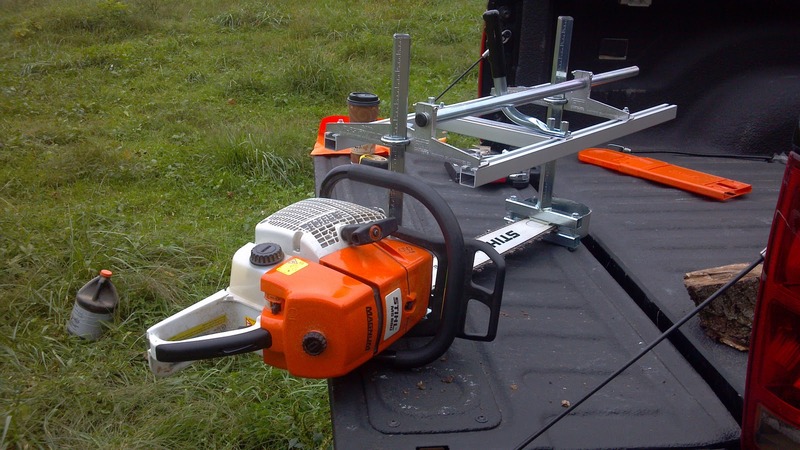 A good initial primer on crosscut versus rip file is at the Disstonian Institute, Saw Glossary, this covers handsaws but the concept is similar for crosscut versus rip chainsaw chains. The biggest thing to note is that whether it's handsaws or power saws the proper file on the blade can make a huge difference. I arrived at the farm around 0800, was promptly offered coffee and breakfast (told you these people are awesome), unfortunately I had already eaten, and we checked the pasture to make sure it wasn't too wet to drive on. Everything looked okay so I drove down and got started. 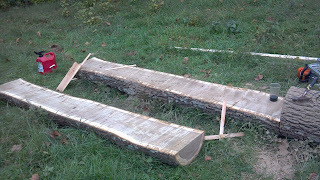 I began by limbing and bucking the tree (removing limbs and cutting up the tree into usable sizes). I made sure I saved any of the crotch areas as they often have beautiful grain patterns for veneer and other showy pieces. This saw eats cuts like this for breakfast, so this was no challenge. Then I set up a track for the milling rig to follow, this gives a flat registration surface for the mill which results in the bar tracking in a straight line for the duration of the cut. Granberg sells an aluminum "ladder" that clenches into the tree for the setup to ride on, but I thought "why spend money on something that might make this easier?" I just shimmed a 2x6 to a rough level on top of the main log and nailed it in after cutting the log to the desired length. Fortunately I had coffee this morning so I made sure I set the depth adjustment on the milling setup to be below the nails I had driven for the rail setup. This worked adequately for this task because I wasn't stressing over getting this perfect. If I really needed an accurate cut, the aluminum ladder setup or something more precise than what I used would have been a welcomed assistance. I believe with a more accurate rail system less wood would have been lost to the chain as well. 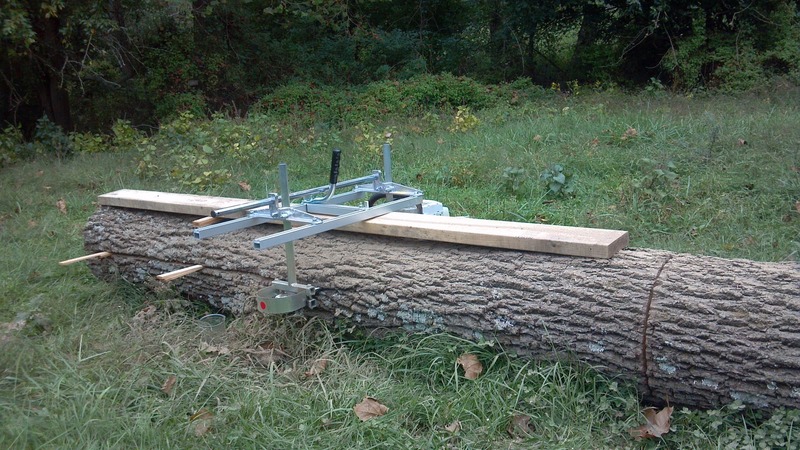 As you might be able to see in the photos, I just used the setup to roughly cut the tree in half. 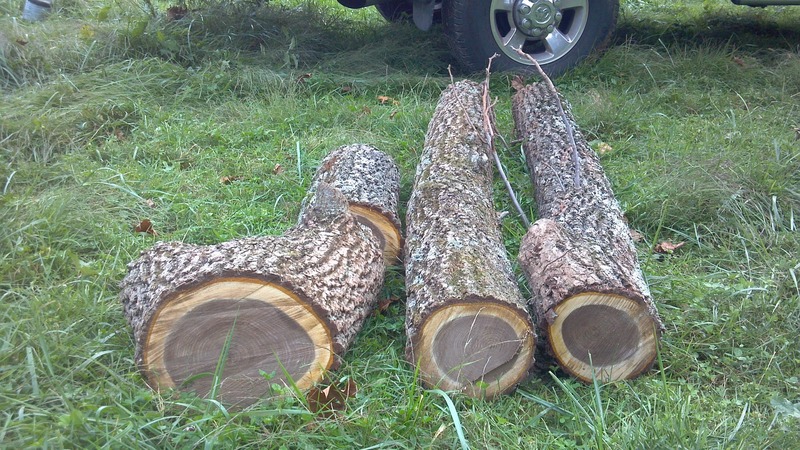 I knew that with the crosscut chain I wouldn't be able to do a lot of milling on this day and I wanted to get these cut up into sizes that I could haul home in my truck. I figured I'd finish the milling at my house as soon as the rip chain arrived...still waiting... The depth adjustments on the mill are actually pretty accurate but it is a chainsaw so there was some "float" in the cut (about 1/4 inch) mostly due to my inexperience and half-assed guide rail system. It wasn't enough to be worried about and when I finally was able to separate the tree the cut was pretty decent. It was really slow going though with the crosscut chain. I made sure to shim the kerf as I cut so that the tree wouldn't pinch the bar. I just used regular cedar construction shims and some cedar shingles I had laying around the garage, they worked great. Fortunately, my friends father was either curious or in need of a laugh so he made the trek down to see what I was up to. I'm glad he did because he was a great help in getting the saw through the last couple inches of the cut and helping me to load all of this onto my truck. If I had continued to mill these into 2" or even 4" planks I could have loaded them easily though. I left the last fifteen feet or so of the tree until the rip chain comes in because it was just too hard on the saw and my patience with the crosscut chain, and when it does I'll have another awesome day on a beautiful farm doing something that I am now in love with. I finished all of this before two in the afternoon, so all in all it was a rather quick day.